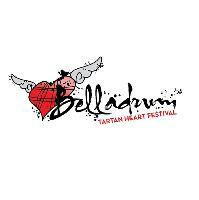 To buy tickets for this event please visit the events page: Belladrum Tartan Heart Festival 2019 event tickets. The festival appeals to a family audience, from babes in arms to grannies in their eighties, and everyone else in between. Its esoteric range of musical genres – from Celtic through mainstream rock and indie to roots, jazz dance and classical – and its catholic coverage of the arts besides music – theatre, street theatre, installation art, literature, poetry, debate, performance art, children’s entertainment and much else besides – make Belladrum resemble a smaller version of Glastonbury north of the Highland line. Bella sold out in 2018, and has sold out each of the last ten years often months before the event, so fans are urged to buy early to avoid disappointment. 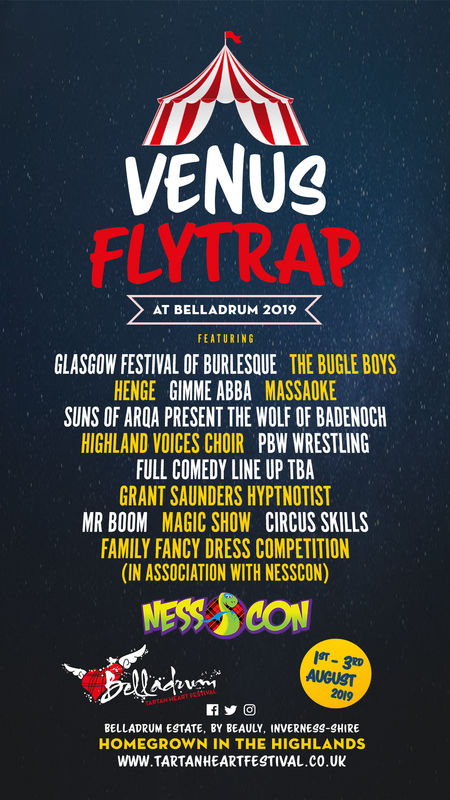 Belladrum 2019 takes place in the beautiful Highland surroundings of Belladrum Estate, near Beauly in Inverness-shire. 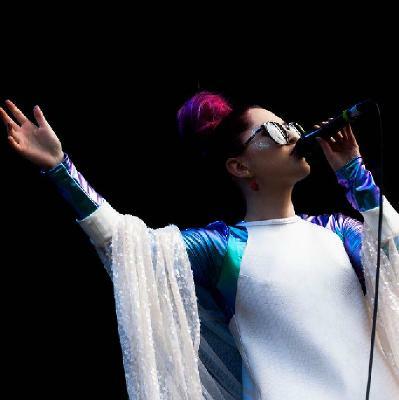 The independent festival has built a reputation for its eclectic line-ups, its offbeat non-musical entertainments and its all-ages approach. Calum Mackenzie Jones & The Trad Project. In addition to your entrance tickets, if you are arriving in a vehicle you must display a valid parking permit on your windscreen when you arrive. This will allow the stewards to direct you to the most suitable car park. You should also download the Audience Leaflet which contains important information regarding the festival, available at the above link. Adult Three Day Ticket: access to parking & camping from 0800 on the Thursday until 1300 on the Sunday. Access to the Arena, including Garden Stage, Grassroots Stage ceilidh etc from approximately 1300 on the Thursday - Arena & stage opening times TBC. Last entry: 10pm Thursday & Friday. Saturday Adult Ticket: access to arenas and campsites from 0900 on the Saturday until 1300 on the Sunday. Last entry: 8pm Saturday. Adult Three Day Ticket: Includes entry to camping & arena (including Garden Stage) from Thursday. Adult Saturday Ticket: Includes entry to camping and arena from Saturday 3rd August. No Thursday only or Friday only tickets will be released. Only valid with photo ID. Child wristbands are issued to match the accompanying adult's ticket type. Children 12 & Under MUST produce original photo ID showing proof of age if asked by gate staff. All under-18s must be accompanied by an adult AGED 21 & OVER and no more than two under 18s may be taken to the event by any one adult. Please only order the child tickets you require and contact Skiddle to cancel any unwanted tickets. NOT VALID unless presented with a Saturday Ticket. Upgrades to full festival entry from Thursday. An upgrade only. Does not include entry to the festival. This ticket adds to your Saturday ticket giving you entry to the camping and arena from Thursday. It is only valid with, and must be presented alongside, a valid Adult Saturday Ticket. 7 x 4.5m Usable Pitch Space. One Per Vehicle. Does not include festival entry or electric hookup. This ticket entitles the holder to one 7x4.5 metre campervan pitch. It DOES NOT include electric hookup. One Per VW Campervan (separate VW area). 7 x 4.5m Usable Pitch Space. Does not include festival entry or electric hookup. This ticket entitles the holder to one 7x4.5 metre campervan pitch in the separate VW Camper area. It DOES NOT include electric hookup. One Per Campervan (separate quiet area). 7 x 4.5m Usable Pitch Space. Does not include festival entry or electric hookup. This ticket entitles the holder to one 7x4.5 metre campervan pitch in the separate Quiet Area. It DOES NOT include electric hookup. 10 x 10m Usable Pitch Space. One Per Vehicle. Does not include festival entry or electric hookup. This ticket entitles the holder to one 10x10 metre campervan pitch. It DOES NOT include electric hookup. Only provides electric hookup when purchased along with a Standard Campervan/Caravan Pass. This add-on ticket entitles the holder to an electric hookup for their campervan/caravan pitch. It is only valid with, and must be presented alongside, a valid Standard Campervan/Caravan Pass. Only provides electric hookup when purchased along with a VW Campervan Pass. This add-on ticket entitles the holder to an electric hookup for their VW campervan pitch in the separate VW Camper area. It is only valid with, and must be presented alongside, a valid VW Campervan Pass. Only provides electric hookup when purchased along with a Quiet Campervan Pass. This add-on ticket entitles the holder to an electric hookup for their campervan pitch in the separate Quiet area. It is only valid with, and must be presented alongside, a valid Quiet Area Campervan Pass. Only provides electric hookup when purchased along with a Jumbo Campervan/Caravan Pass. This add-on ticket entitles the holder to an electric hookup for their campervan/caravan pitch. It is only valid with, and must be presented alongside, a valid Jumbo Campervan/Caravan Pass. Welcome to CLUB CLAN BELLA. After the triumphant return of a VIP area in 2018, Club Clan Bella is back! 2019 is set to be even better with increased bar and coffee offerings and more entertainment throughout the weekend. Your ticket gives you entry to the members’ VIP area at the festival with a range of exclusive perks. Club Clan Bella is situated in the wooded Dell area near to the main stage. Tickets are £47 for adults and £27 for children (12 and under). Toddlers 3 and under do not require ticket. 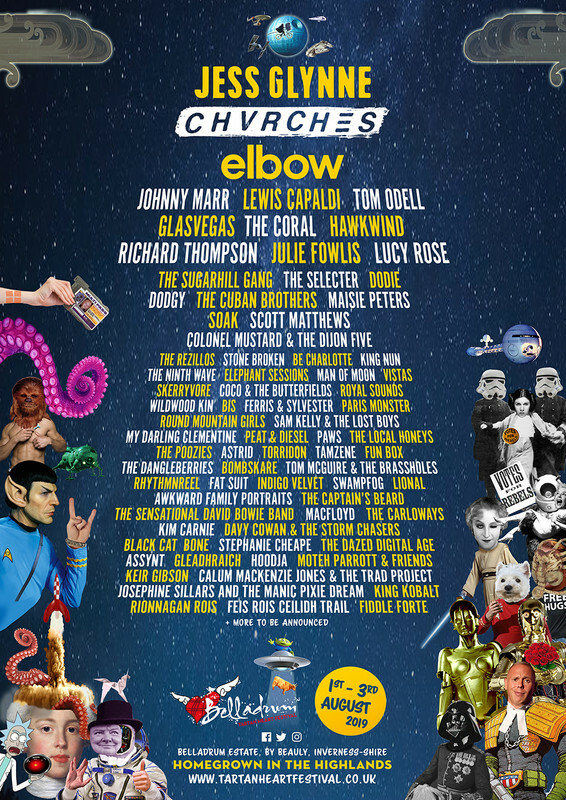 Tickets are available on the main Belladrum Tickets Page. Kids outdoor play zone including straw fort, outdoor games and ‘Bella’ the giant Teddy Bear! Where are the Friendly Flush Toilets located? Are they open 24 hours? Yes, Friendly Flush will be providing Showers and Happy Hair passes at the Friendly Flush Exclusive Loos location - both available as a pay on the day service! In order to access this 24 hour facility you will need to leave the arena. Please note: there is no access from GLAMPING or CARAVAN/CAMPERVAN fields to Friendly Flush between 0200 & 0900 as arenas are closed. The wristband allows access to a 24 hour attended toilet service with little or no queuing, kept spotlessly clean 24 hrs a day and filled with loo roll. There will be a separate area to sit and apply makeup with mirrors as part of your toilet entry ticket. Opening times are from 1600 on Thursday 2nd August through until 1300 on Sunday 5th August. Please note - photo ID may be required for 12 & unders. Unfortunately this service is not suitable for those with mobility issues - Mobility toilets are located within the Mobility camp site. To pitch your tent in Clean Fields doesn’t cost you anything extra in cash terms. You just need the right wristband from us. Clean fields will be spotless when you arrive. Please keep it like that during the event and leave it that way when you leave. Everything you bring into Clean Fields, you must remove or dispose of in the appropriate bins provided. All camping equipment must be taken away from the festival or left at the gate in the charity compound – please don’t drop it in other camping areas. Keep it peaceful – don’t keep your neighbours awake with bongos! Clean Fields will be situated in the Green camping areas. In order to limit numbers of persons camping and parking in the Mobility Area, specific rules apply to acquiring Mobility tickets, carers’ tickets and guests in that area. Parties are restricted to four and only one car per party. Is there Mobility camping and parking? I’m disabled – what do I do about tickets and how does my carer get one? You should buy your ticket in the normal way through our tickets page and select the parking pass suited to the area where you want to camp. For your free carer’s ticket, you should then apply to Mary Ferguson with evidence of disablement (ie photocopy/scan of DLA letter front page) - email: maryferguson72@btinternet.com. You should buy your ticket as normal via our tickets page and then apply for your free carer ticket with evidence of being a Blue Badge holder to Mary Ferguson (email: maryferguson72@btinternet.com). Assuming you qualify, Mary will also issue you with your Mobility Camping & Parking area passes and your Mobility Area Vehicle pass. She will also give you a link where you can download your Orange windscreen hanger (which does not allow access on its own). Where is the Mobility Campervan/Caravan area? The Mobility campervan/caravan area is situated within the main campervan field in an area closest to the main arena. You need to have tickets to this area and to have qualified for these as a blue badge holder. To get a campervan/caravan ticket for the Mobility camping area and an electrical hook-up if you require one, you should apply for these through Mary. Do not buy these tickets through the normal tickets page. Where do I park as a blue badge day visitor? If you have a Mobility Area pass and Mobility Area Vehicle pass, you can day park in the Mobility Parking & Camping area. It would be helpful if you could let Mary know in advance if you plan to day park so that we have an idea of numbers. Are all areas of the festival accessible by wheelchair? Yes, and there are special viewing areas in many of the arenas; however this is an outdoor event and conditions could become muddy and slippery. Your ticket is valid for one person only. You are advised to check your ticket upon receipt. Please read terms and conditions on the ticket (or at www.tartanheartfestival.co.uk ) as your purchase of a ticket signifies your agreement to these. No tickets will be refunded unless the event is completely cancelled in which case only the face value of the ticket will be refunded. If some elements or part of the event is cancelled (e.g 1 day out of a 3-day festival), the promoter reserves the right to offer pro-rata refunds accordingly but is not obliged to. If the Festival is cancelled, the Promoter shall not be liable for any costs or expenses wasted or incurred by the ticket-holder including but not limited to: accommodation or transport costs, or any direct or indirect losses or damage of whatever kind. Lost, stolen or incomplete tickets: admission will not be allowed to persons without ticket and stub (joined) in the case of hard tickets, or to a person presenting a ticket that has already been scanned in the case of e-tickets, or to persons whose tickets have been lost or stolen; keep tickets safe – treat them like cash. Lost or altered wristbands: attendance without the relevant wristband issued by the event is not allowed and will result in ejection; wristbands that have been tampered with or removed will be declared invalid and lost wristbands will not be replaced. Glass, dangerous objects, drones, flares, Chinese lanterns, fireworks, animals, illegal substances, nitrous oxide and legal highs: none of these are permitted at the festival venue and will be confiscated; use of fireworks, flares or Chinese lanterns will result in immediate ejection; animals will be impounded at owner’s expense; patrons’ clothing and bags will be searched at gates. Alcohol: no alcohol may be brought into the arenas from campsites; patrons’ clothing and bags will be searched at gates. Campervan/Caravan tickets: holders of these must also hold valid tickets to the event to be allowed entry to the arena; entry to the campervan/caravan area will only be allowed to drivers of vehicles holding a campervan/caravan ticket (regardless of whether they also hold an electrical hook-up supplementary ticket); each standard campervan/ caravan ticket entitles the holder to a maximum 7 x 4.5m space and the ticket is valid for one campervan, or one car/caravan or factory-made trailer-tent only; a campervan must have fitted sleeping and fitted cooking or washing ; no sleeping tents may be pitched in the Campervan/Caravan area. Clothing & equipment: this is an outdoor event; it is your responsibility to be prepared for all weather conditions and to bring appropriate clothing and camping gear. Amplified music: will not be permitted between 2300 and 0800 in camp sites. Disclaimers: you use the festival venue at your own risk; the promoter shall disclaim liability for death or personal injury caused by the negligence of the promoter, its servants or agents or any person whilst entering or leaving the festival venue; the promoter shall disclaim liability for death, injury, disease or loss caused to any person or to his servant or agent at the festival venue; the promoter shall disclaim liability for any loss, damage or theft to property including vehicles at the festival venue; the promoter shall disclaim liability for any inaccuracies in any information published with regard to the event. These terms and conditions are governed by the laws of Scotland and the Scottish courts have exclusive jurisdiction in the event of dispute.